Foggy, cold late summer days in August and September 2002. Somewhere on Earth, more exactly on the land mass anywhere between the poles. A forsaken landscape commonly known as the wood quarter. A usual day as the hundreds before. An unusual day, as no one before. I woke up. I did not really know what to do, so I decided to visit my local bike dealer. I supposed, he would have some special offers for the last 2002 bikes on stock. And yes, he had. There it was. The feelings you become aware of, when you say "love at first sight". It was fascinating. The XL full suspension alloy frame decorated with highly delicate XT/XTR components. The low ratio suspension which keeps the angle constant and improves performance to a never seen, comfortable, full XC functional racing bike, before. Devine. Ok, the color combination could have been selected with a bit more enthusiastic touch – but who really cares, when it is covered by stinking mud…? 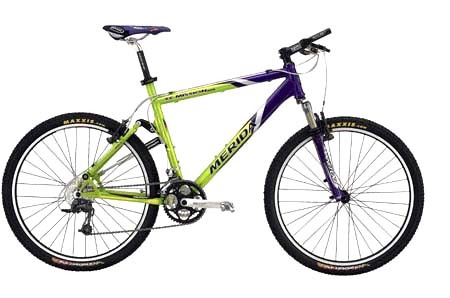 That’s how the original Merida XC Mission Elite looked like. So I rode the bike and was… yeah, I have been persuaded immediately. The well harmonizing XT/XTR components made the decision easy: I wanted to have it. But I tried to perform a much more reserved strategy (even my dealer already got note from my joy :-), the price was still very high (~ 2.800€)… To make a long story short. The dealer sold the bike for 2.100€, the backup spring for the rear damper included. 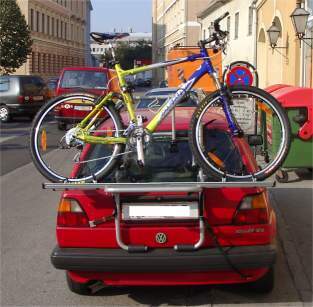 The bike pickaback on my old VW GOLF. Now I ask you? Should I’ve sayed "no"? Should I’ve realy had to miss that chance? Nay. In fact, I didn’t. It took me exactly 2 days, 1 hour and 34 minutes till I had enough spare time for my first real, intensive ride with my new toy. Oh god, was that bike great. 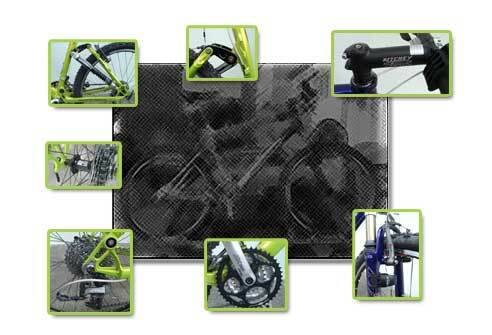 The fascinating cooperation of all the beautiful, clean, high tech components. The seamless, light-weight alloy frame, that fitted exactly to my body’s size. 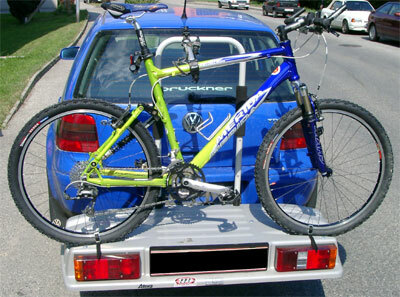 Unfortunately the weather was not that good to drive more than about 300km with that bike in summer/fall 2002. Till now, it fulfilled my expectations. ‚Hope it will continue.. So long, now here are some pictures to enjoy. I think it was in the late fall 2002, when I decided to sell my old, but still well serving vehicle – my beloved VW Golf II. A new one caught my fancy, just a few days ago, found via Internet. Atera Duro’s base it made of plastic and protects the bike from the road’s dirt. It serves quite well, unless you don’t leave your Polar S710 unmounted on the platform and start driving home from your last run… But that’s an other story.